The amount of snow and ice melt in the Midwest is monumental. 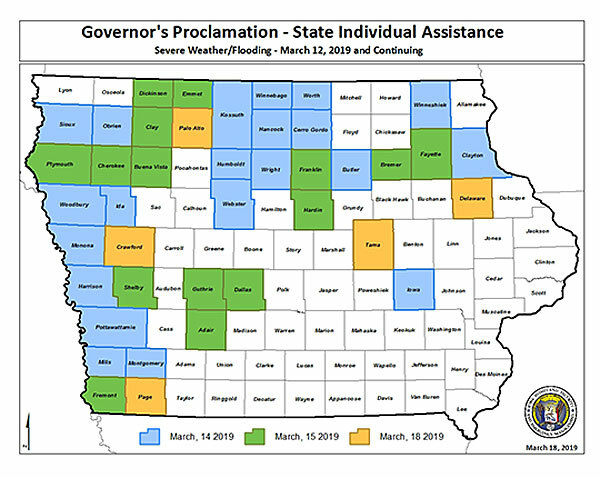 Iowa Governor Kim Reynolds issued disaster proclamations for 41 counties because of flooding (Click on the map to see details). News photographs show Offutt Air Force Base in Bellevue, Nebraska, home of the U.S. Strategic Command, is one third underwater with at least 30 buildings damaged. Warmer atmosphere held more water vapor which was dumped on Iowa and surrounding states in the form of snow and rain during recent polar vortex events. Wild swings in temperature, sometimes as much as 70 degrees in less than 24 hours, combined with rain quickly melted the snow. Because of deep frost in the soil, there was nowhere for the water to go but downstream. Iowa is used to spring flooding, but not like this. Climate change created conditions for this flooding, both by enabling a warmer atmosphere to hold more moisture, and through warming in the arctic, which destabilized the trade winds and made the polar vortex. It has been depressing to live through this winter. The damage we see on our small lot in rural Iowa is minuscule compared to the bigger picture. Last week, Al Gore and the Climate Reality Project trained another 2,000 leaders in mitigating the effects of climate change. News media cover climate change now more than in recent years because viewers and readers experience its effects every day. Climate change is real, it is happening now and we hope it’s not too late to find the political will to do something about it. The state is watching how our governor and other politicians react to this iteration of flooding. This entry was posted in Environment and tagged climate change, environment, global warming, Local Events, sustainability, The Climate Reality Project. Bookmark the permalink. So Long Dave, It’s Been Good to Know Ya!